Highlighted below are some of the many standard features of the GSL Artira wheelchair lift. For more extensive information, consult the Artira Design & Planning Guide or contact your local Garaventa Representative. The Artira Call Stations are operated by a computer based lift control system that intuitively guides the user through the operating sequence by illuminating the appropriate button to push. Fold and unfold functions are fully automated by simply pushing the easy to use call station buttons. The ultra-quiet Drive System is located at the upper end of the Artira and is available in two arrangements; the standard Drive Box and Compact Drive, both drive systems operate using Mains Power. The Curved Safety Arms are fully automatic. When in the guarded position, the inside dimensions of the arms do not take away from the clear platform size of the wheelchair lift. 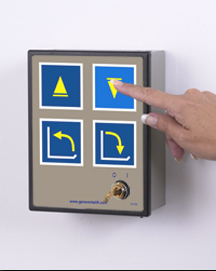 The durable and vandal resistant platform control panel consists of two large illuminated Directional Control Buttons and an Emergency Stop Button. The sensors will automatically stop the lift if the platform should encounter an obstruction. The GSL Artira reduces the speed of travel by 50% prior to reaching corners and is programmed to slow the platform travel speed when approaching or departing the landings. This illuminated tube lighting is located at the base of the ramps visually alerting pedestrians of the platform's location during travel. When pushed this large red button will immediately stop the lift. The Artira is finished in a durable polyester powder paint coating that is electro statically applied and baked. Garaventa's standard color is Satin Grey (fine textured).